With a population of around 275,000, Markham is the fourth largest community in the GTA only after Toronto, Brampton and Mississauga. The head office of Goldfinger Law is located moments away from Markham. Markham is made up of several smaller subdivisions which are Greensborough, Buttonville, Cornell, Wismer, Unionville and Milliken. Still, those subdivisions are further divided into even smaller suburban districts or communities within Markham. These include but are not limited to Langstaff, Thornhill, German Mills and Markville. Markham has a bustling economy which houses the Canadian headquarters for a number of multinational corporations including but not limited to IBM, Apple, Amex, Toshiba, J&J and Motorola. Markham is one of those more affluent municipalities in Canada, with an average house value of around $450,000; compared to the province wide average of around $300,000. Markham has no Courts. If there is a personal injury action to be issued which took place in Markham, it would need to be issued at the Superior Court of Justice in Newmarket on Eagle Street, or elsewhere in Ontario. 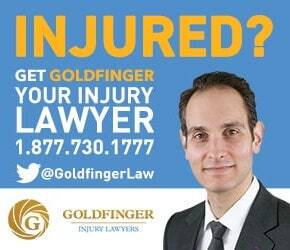 The personal injury lawyers of Goldfinger Law often issue car accident and traumatic brain injury cases at the Newmarket Court House. Accident victims for car accidents in Markham, or for other serious or catastrophic accidents are generally taken to Markham-Stouffville Hospital. The Shouldice Hospital, which is not really related to personal injury accident claims as its famous for the care and treatment of tumours is also located in Markham. For those accident victims who live close to Steeles Avenue, or near its border, and the Markham-Stouffville Hospital is too far, or too busy, they may be taken to The Scarborough Hosptial-Birchmount Campus in the City of Toronto. The personal injury lawyers of Goldfinger Law regularly attend to visit clients at all of these hospitals. Markham has many public and catholic high schools, but it doesn’t have any universities of colleges. Markham also does not have a very comprehensive on road bike route system making it a potential danger for cyclists. Markham is the home of many famous athletes including Olympic Silver medalist and Lou Marsh Trophy winner Bill Crothers, WNBA All-Star Tammy Sutton-Brown and NHL All-Stars Steven Stamkos and Jeff Skinner. Highway 404 and 407 pass through Markham making it busy for commuter traffic and often resulting in a number of car accidents requiring a personal injury lawyer.